Lessons from my week…back up, back up, back up! This week I had a bit of a scare when my computer decided to play tricks on me. At one stage all of my files completely disappeared – everything, just gone! But then I found them, mostly, tucked away in random folders. Weird! I feared a virus and had a stressful weekend running scans, searching for viruses and restoring my folders. No viruses were discovered – at best I think I accidently clicked something that reordered my folders. Silly me! I’m kind of pedantic about running virus scans and backing up my files anyway, but this was a good reminder to keep doing this and perhaps do it a little more regularly. The big plus is that I went through all of my folders and ‘cleaned house’. There were files that I really no longer needed, lists I had created and long ago finished with, etc. Now all my files are cleaned, archived, trimmed, renamed and logically ordered…it’s fantastic! This did mean that yesterday I was still madly in caught up in the throes of folders and files and documents and scans – hence I did not blog! Sorry. There are a couple of work projects that were important not to have ‘lost’, but these had not been worked on since I last backed up anyway, so I knew these were fine. The worst part was thinking I had lost a few days of novel writing because for a while there, the only version I could find had the same date as my last back up…and I knew that wasn’t right. Usually if I am writing on the fly and, for whatever reason, I have no time to back up, I usually email the file to myself. Why hadn’t I done that this time? Oh that’s right: sitting in café drinking too many coffees, writing like crazy and then realizing the café has no internet access. For days I stressed about those fabulous pages I had written that were potentially lost – they were the best bits of writing I had ever done! Ok, well at least it felt like that…pure gold, lost and found…and you’re right, on rereading those pages, they need as much editing as any other bits of my first draft, but gee, I’m glad I found that file! 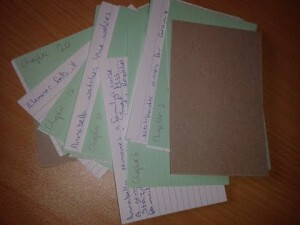 My novel on index cards. Regarding my writing though, I have been on a bit of a roll ever since I fully plotted my novel. 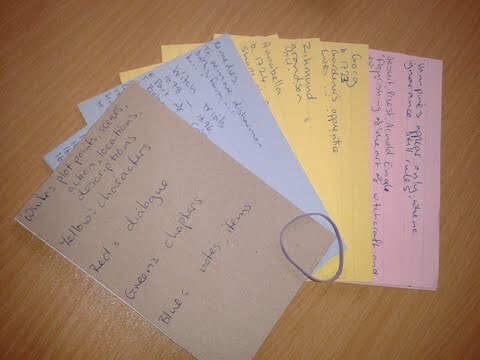 I gave up trying to plot this electronically, deciding instead to stick with the more visual index card method. I loved being able to spread the cards out before me and move then around as I saw fit. I still only wrote short dot point style notes for plot points, but it was enough to give me a sense of the whole story. The plot – in chapters! 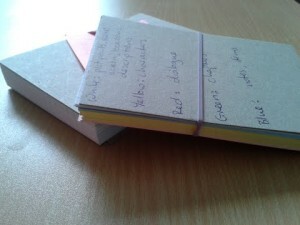 Using index cards is not a complex way to plot at all. I started creating character cards (yellow) and a few plot cards (white). I added notes cards (blue) as needed and dialogue cards (pink) as bits of dialogue I didn’t want to forget came to me at random times. Finally, when I felt I had enough plot points and the idea of the novel was developed sufficiently, I grouped the plot point cards into chapters. It was a very enjoyable exercise and has motivated my writing. Now I am working through the chapters, writing out the parts that have not yet been written. What fun! This entry was posted in Novel and tagged Novel in a year, Plot by mjsweeney1. Bookmark the permalink.